Heat the olive oil and butter in a large non-stick frying pan and fry the bread cubes until golden. Drain on kitchen paper and set aside. Add the bacon to the frying pan and cook until crispy, then remove from the pan. Cook the mushrooms gently in the bacon fat for 3-4 minutes on each side. At the same time, poach the eggs in gently simmering water for 3-4 minutes, until the whites are set and the yolks are runny. Place the mushrooms onto 4 warm serving plates, gills facing up. At this point, add the tomatoes and chives or parsley to the frying pan and cook over a high heat for 30-40 seconds. Return the bacon to the frying pan and heat with the tomatoes for a few more seconds. Season with black pepper, then share between the mushrooms and add the croutons. 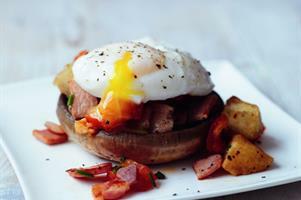 Serve each mushroom with a poached egg on top, sprinkled with a little extra black pepper.